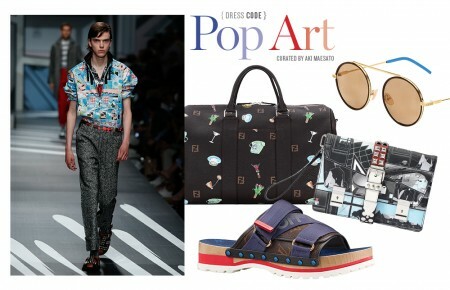 The utilitarian, mechanical nature of a timepiece makes it the ultimate place for a guy to confidently express his inner flashiness without pushing the boundaries of good taste. Although sprawling at 48mm, the military-inspired Avenger Blackbird, left, is also incredibly light due to its titanium casing. Technical, but sophisticated, it’s a chunky watch without the undue tonnage. The robustly styled Chronomat, center, has a rotating bezel for tracking world time and features distinct fonts, functions and colors on its 44mm dial. A world traveler’s watch, the Navitimer World is a veteran globetrotter, packing dual time zones, a red-tipped 24-hour global hand and more into a hefty 46mm case. 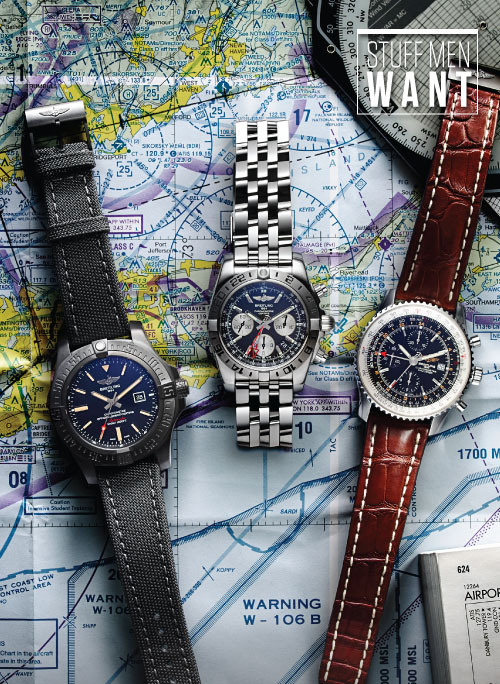 These Breitling aviation style timepieces are available at Libutti Jewelers, Huntington, (631) 427-0126. Rolex launched in 1905 and continues to break ground today. 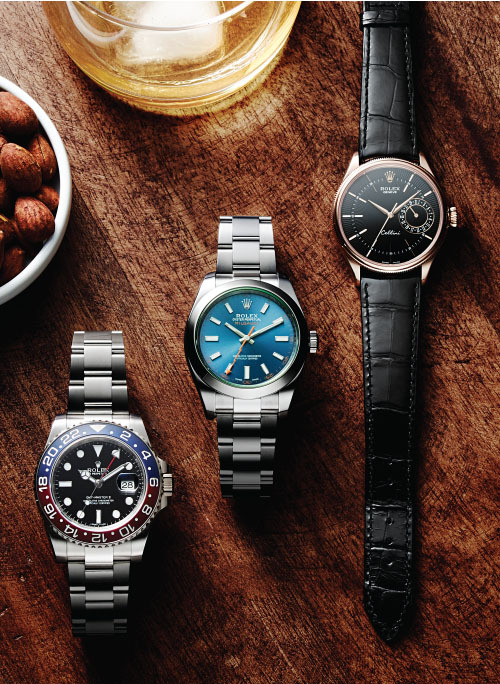 Their self-winding white gold GMT Master, left, is unapologetically flashy, featuring a rotating red and blue bezel, black dial and sapphire crystal to handle any situation on land or at sea. The anti-magnetic Milgauss, center, is characterized by its green sapphire crystal and lightning bolt second hand. It was developed for scientists and engineers who work with the truly cool big-boy toys. The Cellini Date in rose gold is a classic dress watch rooted in the present. It’s thin and graceful at 39mm and its dial date display is a rarity for Rolex, which typically displays their calendar function in a magnified window. Available at H. L. Gross & Bros., Garden City, (516) 747-6666. Breguet is a watch appreciators’ watch and the Horamundi, left, has a host of extras that make it a standout. Available in rose gold or platinum, the watch can memorize two time zones and jumps between them at the push of a button. The piece is also available with three different dials depending on where the owner spends most of his time: the Americas, Europe and Africa, or Asia and Oceania. Panerai’s Radiomir Rattrapante, right, is distinctively offbeat and inimitably Italian. Produced in limited numbers, this split second chronograph comes on a crocodile strap at an impressive 45mm. 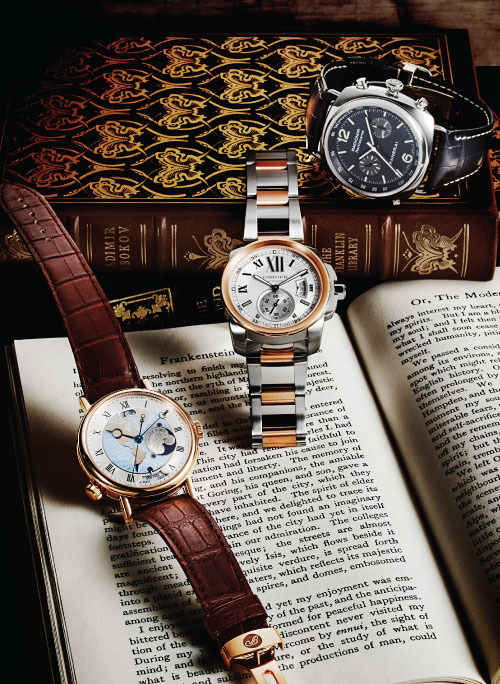 Suave and contemporary, the Calibre de Cartier has a more rugged profile than many of the brand’s offerings, but maintains the distinguished DNA that has characterized Cartier since the first wristwatches were produced in the early 1900s. Available at London Jewelers, Americana Manhasset, (516) 627-7475. 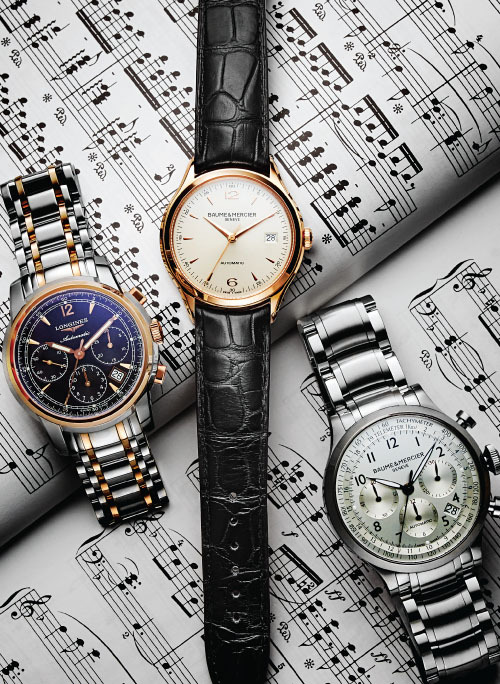 Blending classic styling with modern movements, Longines timepieces have been used to time horseraces for decades. This self-winding Saint-Imer, left, features a trio of subsidiary dials and clocks in at a very current 41 mm. Rendered in rose gold with an ivory dial, this Baume & Mercier Clifton, center, exudes an effortless charm by keeping things simple. Baume & Mercier’s Capeland Chronograph offers vintage styling offset by contrasting features. It has a transparent caseback and prominent, rounded buttons as well as graduated telemetric and tachymeter scales in case you need to do some surveying. Available at Gelber & Mundy, Great Neck, (516) 482-1585.